People participate in the annual Afropunk Music festival on August 27, 2016 in New York City. The AfroPunk Festival in Brooklyn has grown since the annual event began in 2005. As it has expanded, so have the choices it offers: you can see everyone from Ice Cube to George Clinton, to Brit Rockers Skunk Anansie. There's a lot to catch, so here are five artists to keep an eye out for, at the festival and beyond. This gentle, thoughtful and funky performer might not be a household name for many in America. But in England, Laura Mvula is a pop and soul phenomenon. You may have heard her on the soundtrack of the 2013 film 12 Years A Slave (look for the aching "Little Girl Blue"). Her latest album The Dreaming Room, was released earlier this year, and it features the instrumental crew of the London Symphony Orchestra. Part of Mvula's charm is her many contradictions: she has said that she never intended to become a musician, yet has an otherworldly talent. Her voice rings strong and assertive, her presence can be intimidatingly cool, but her lyrics explore her struggles with anxiety and paralyzing stage fright. Her sound might be softer and more melancholy than others in the AfroPunk universe, but her frankness about her vulnerabilities is about as punk as it gets. I've been listening to Skunk Anansie since the late 90s, and had never been able to catch them live. After they went on hiatus in 2001, I gave up on that dream. So this weekend is a very special treat. The 1990s effervescence of Brit Pop, new punk and grunge rock had been a white man's world. Skunk Anansie came onto the scene as something completely different: Skin, the lead singer, self describes as a "black, bald-headed, bisexual Amazonian" from a working class background. Although very soft spoken in interviews, her vocals are rich, vibrating whispers. And if the weakness of great 90's rock was that it was navel gazey in its melancholy, Skunk Anansie's provocative "Intellectualise My Blackness" and "Selling Jesus" were completely refreshing to those of us who wanted the sound, but with less whining please. I recommend you check them out, and pay your respects to Brit rock royalty. This video contains profanity and other language that listeners may find offensive. Alongside one of hip-hop's most rebellious pioneers, Ice Cube, and funk architect/living legend George Clinton, California's appropriately self-titled Tyler, The Creator leads this year's Brooklyn-based AfroPunk lineup. If we're being honest, it was a long time coming; he's checked "other" on the hip-hop ballot box from day one. Since his start, he's sanded down the edges of his jagged entry into the genre by homing in on the punk style popularized by Pharrell and N*E*R*D. If you go back in his discography, you can hear flashes of his true musical desires underneath the silly, debatably offensive, joke raps he kicked with his friends on his early mixtapes and his debut album, Goblin. By the time he followed up with his second studio album, 2013's Wolf, Tyler was taking himself and his sound a bit more seriously. On last year's Cherry Bomb, he finally dove headfirst into the style and resurfaced as the perfect candidate for a festival that prides itself on in-your-face otherness. There's never a dull moment with Tyler, The Creator, both musically and performance-wise. Pro tip: If moshing isn't up your alley, you might wanna stand in the back for this one. Formerly known as SPZRKT (pronounced Spazzy Rocket), singer Xavier Omär came up quick last spring. Alongside producer and Soulection favorite Sango, Omär catapulted to prominence amidst the feeding frenzy of underground talent bubbling up through the SoundCloud platform. The two, outspoken Christian musicians, collaborated and wound up with Hours Spent Loving You, an EP which intertwined messages of appreciation of the love found on earth and in heaven. (To put things into perspective, the standout track was titled "JMK," short for "Jesus My King.") Shortly after the release, the vocalist changed his name from SPZRKT, and made a concerted effort to work within a more secular space, hoping to make a bigger impact on the industry through broader messaging. He's succeeded thus far by lending his voice to projects helmed by women: DJ Kitty Cash's collaborative mixtape, Love The Free Vol. III, and Chicago rapper Noname's astoundingly astute debut project, Telefone. If you're looking to explore a gentler side of AfroPunk, Omär is your perfect entry point. 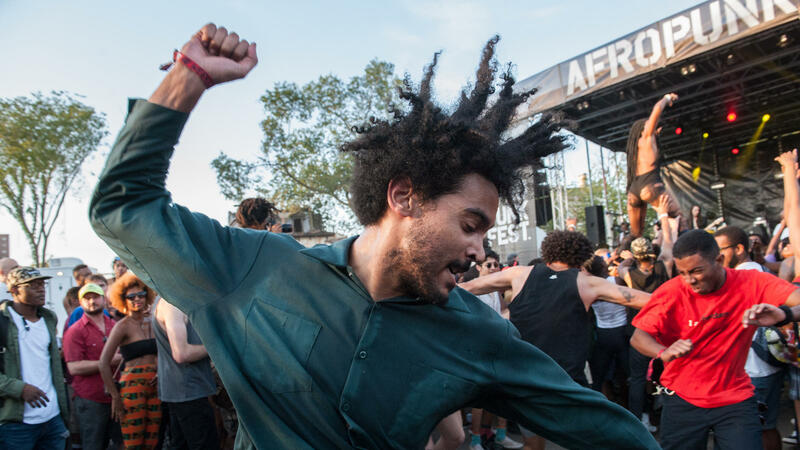 One of the most enticing qualities of AfroPunk is its openness to the interpretation of the word "punk." By adding poet Nikki Giovanni to the bill, the festival is showing that punk comes in various forms and countless definitions. Now 73, Giovanni teaches as a University Distinguished Professor at Virginia Tech, where she's been for nearly three decades. But the Tennessean and literary giant's journey has been filled with moments of being an inquisitive outlier, propelled by defiance and self-sufficiency. Her first book was published through a company that she created herself, and her degree from Fisk University came after she was expelled, then re-admitted. Just as she was throughout the latter half of the 20th century, the Grammy-nominated Giovanni remains a poignant voice of authority on black identity and social issues. Poetry can be punk, too.